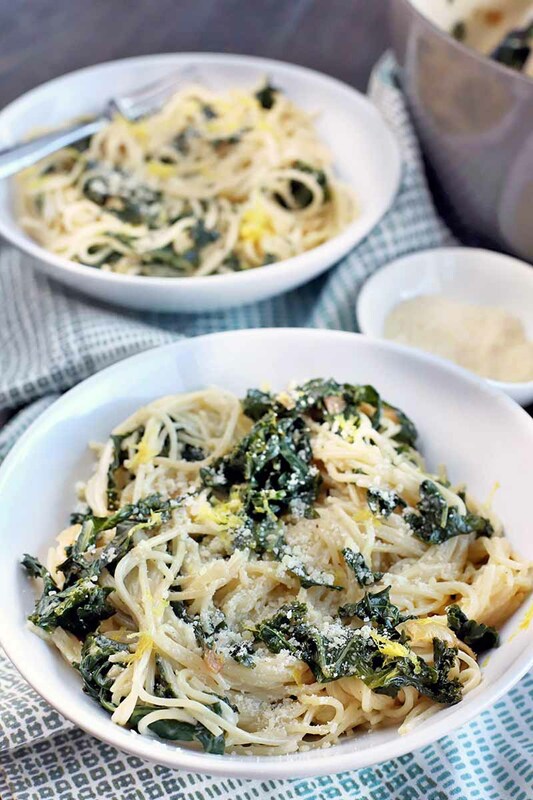 https://foodal.com/recipes/pasta/angel-hair-with-braised-kale/Kale, that dark and leafy vegetable that bears at least a passing resemblance to spinach, was not something I grew up eating. 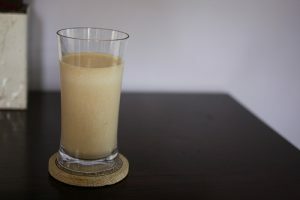 My parents, to this day I am sure, have never purchased it and never ordered it in a restaurant. I would have been very content to leave it out of my life too, and to continue believing in its supposedly unappealing nature, if is was not for food blogs. It’s very healthy, and it’s deep green or purplish, and it’s not exactly like candy the first time you try some. But it has its positives as well. 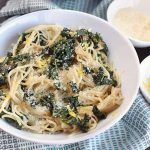 When I made this braised kale with pasta, it was not my first time trying it – I’ve made an attempt at kale chips, and there was the time when I burned a bunch that I was blanching on the stove. But this experience was different. While I was cooking the kale with garlic, onions, and olive oil, the fragrance of it all filling the kitchen, I realized something: I genuinely have no problem with this vegetable. None. The first time I became aware of its burgeoning popularity, I felt confused, then reluctant, but this time I felt more at ease, with an open mind. I was ready to accept kale into my life, and with the right recipe, I’d even say I like it. For someone with various past food aversions, that is truly something. 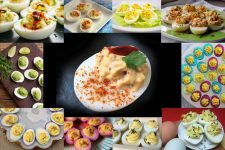 Through food, we can learn to soften prejudices and release stubborn opinions about things like a much-maligned green vegetable. Maybe experiences like these can even teach and encourage us to extend that flexibility to the rest of life, you know? I hope so, for my sake and that of everyone who knows me. When previously held misconceptions are proven wrong, maybe we can use these opportunities to learn to let go of them more quickly in the future, and to open our palettes, our dinner tables, and our lived experiences to new truths. 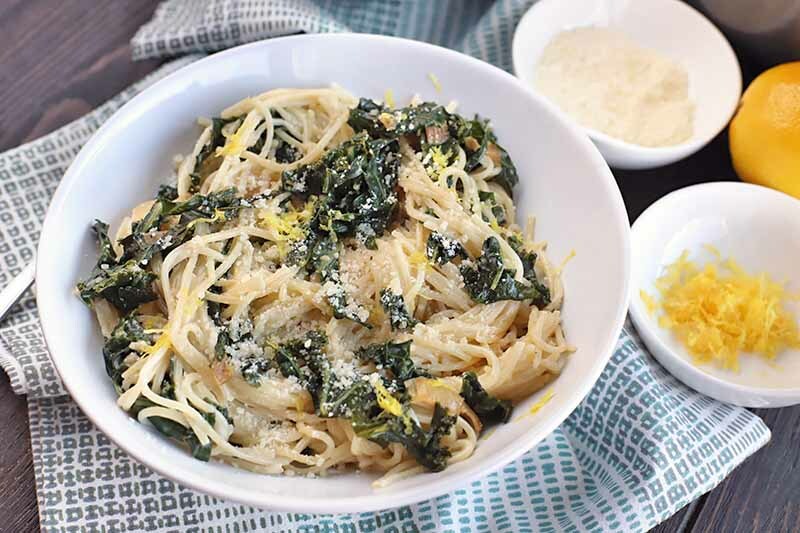 Whatever you take away from this simple recipe, now that is is deliciously simple, a lightened up pasta creation that’s easy to make, flavorful, and nutritious. 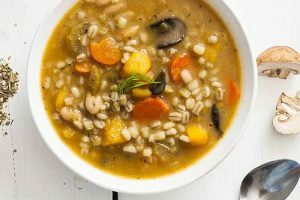 Are you on the hunt for a healthy meal with lots of flavor? 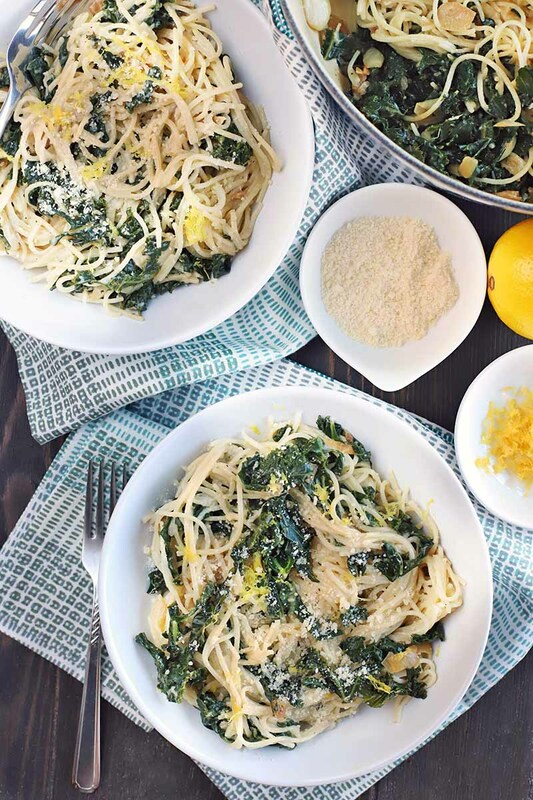 For a lightened up pasta dinner, this angel hair with braised kale is a tasty and easy option. Remove ribs and stems from the kale. Cut crosswise into 1/2-inch slices. Rinse and drain; set aside in a bowl. Peel and finely chop the onion. You should have about 1 1/2 cups in total. Heat 2 tablespoons olive oil in large, heavy pot over medium heat. Add sliced garlic and sprinkle with salt and pepper. Cook until onion is golden brown, stirring occasionally, about 5 minutes. Add kale and remaining tablespoon olive oil and toss until wilted, about 3 minutes. 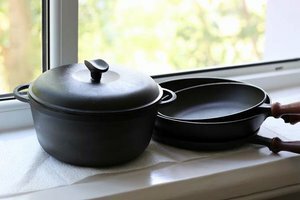 Cover pot and reduce heat to medium-low. Continue cooking until kale is very tender, stirring occasionally and adding water by teaspoonfuls if dry, about 20 minutes. Meanwhile, cook pasta in a medium-sized pot of boiling salted water until al dente, stirring occasionally. Drain, reserving 1/4 cup cooking liquid. 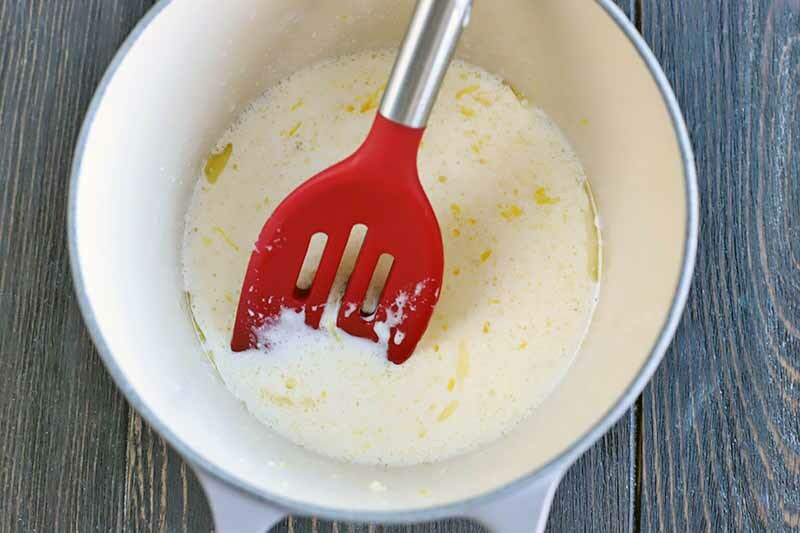 Melt butter in a small saucepan over medium-high heat. Stir in lemon zest, lemon juice, cream, and reserved pasta water. Cook until thickened, about 5 minutes. 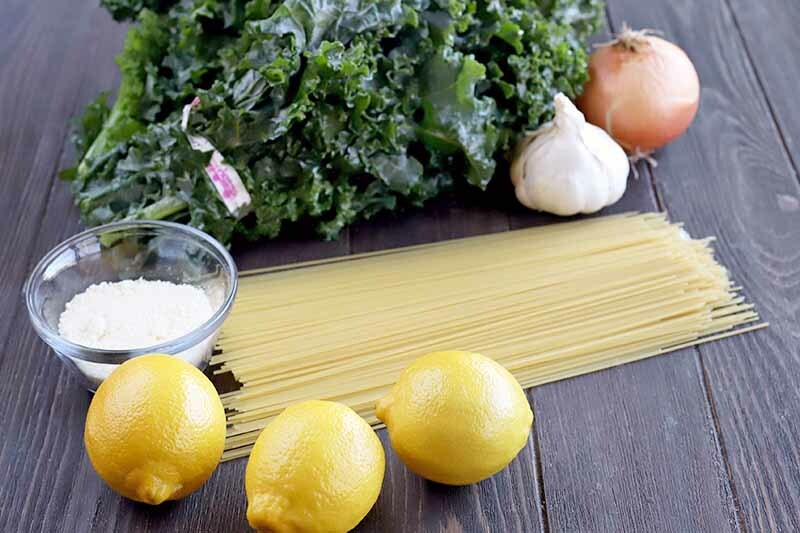 Add cooked pasta and lemon sauce to the kale mixture. Toss to combine. 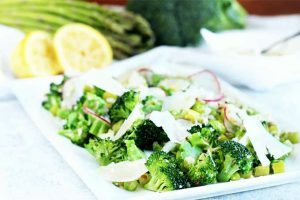 Serve garnished with additional lemon zest and Parmesan cheese as desired. Adapted from Molly Wizenberg, Bon Appétit, October 2009. 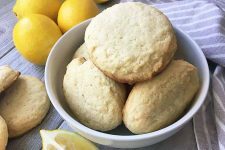 With a microplane or zester, zest the lemon. Slice the citrus in half and juice it, and remove any seeds. Cut or tear away the kale stems and discard. Chop the leaves into ½-inch pieces, and set aside. Peel the onion, and finely chop it. 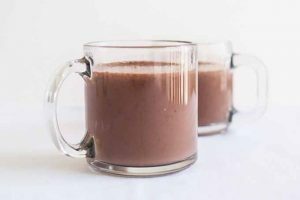 You should have 1 1/2 cups in total. If this is a task that you avoid, check out our tips for saying goodbye to those tears! 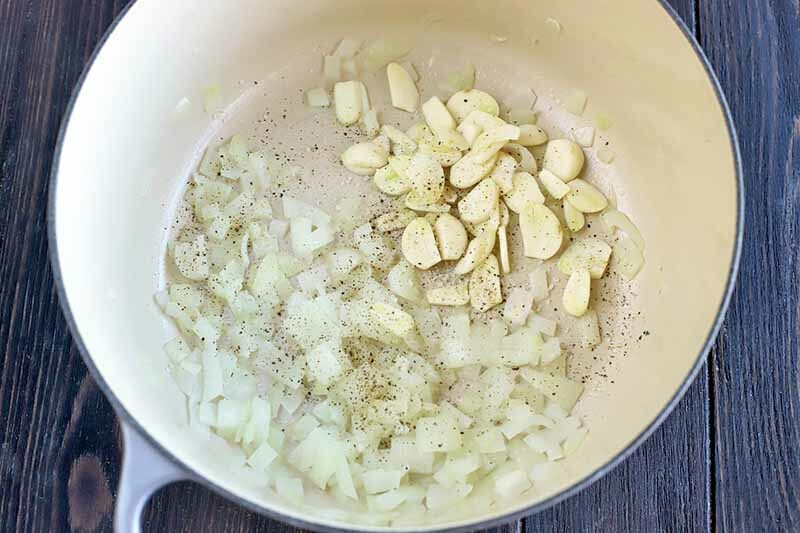 Peel the cloves of garlic, and thinly slice them. 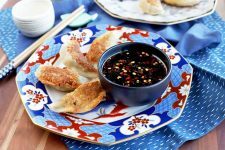 You can use less than the 8 cloves called for if you prefer, but I enjoy a really garlicky dish. Measure out all remaining ingredients as listed on the ingredients list. 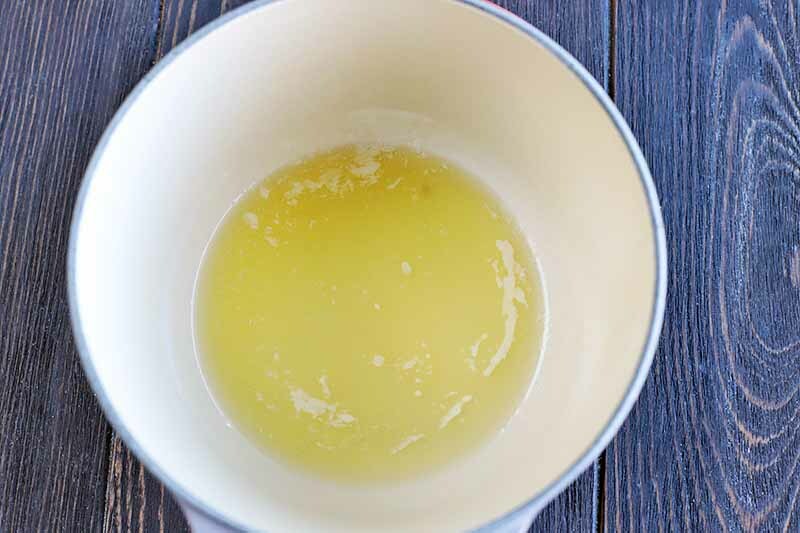 Add 2 tablespoons olive oil to a large, heavy-bottomed pot over medium heat. Add the onion and cook until translucent and soft. Stir occasionally as the onion cooks, for about 6 minutes. Stir in the garlic, ¼ teaspoon salt and ½ teaspoon freshly ground black pepper. Continue to saute until the onion is golden brown but not burned, stirring occasionally, for about 5 minutes. Stir in the kale and the remaining tablespoon of olive oil. Cook until wilted, tossing occasionally, for about 3 minutes. Cover the pot and reduce heat to medium-low. Continue to cook the kale until it is very tender. Stir occasionally, adding teaspoonfuls of water if the pan is getting dry. It will take about 20 minutes to cook down the leafy greens. 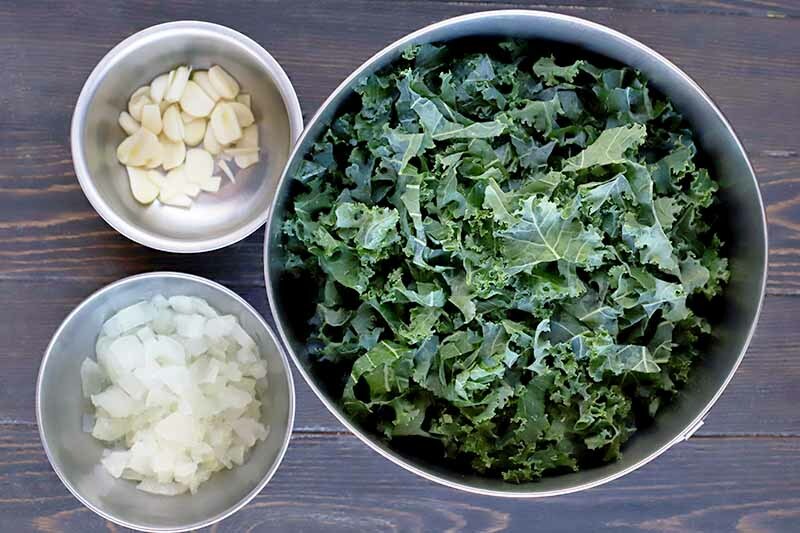 While the kale is cooking, bring a pot of salted water to a boil over medium-high heat. Cook until al dente, stirring occasionally. 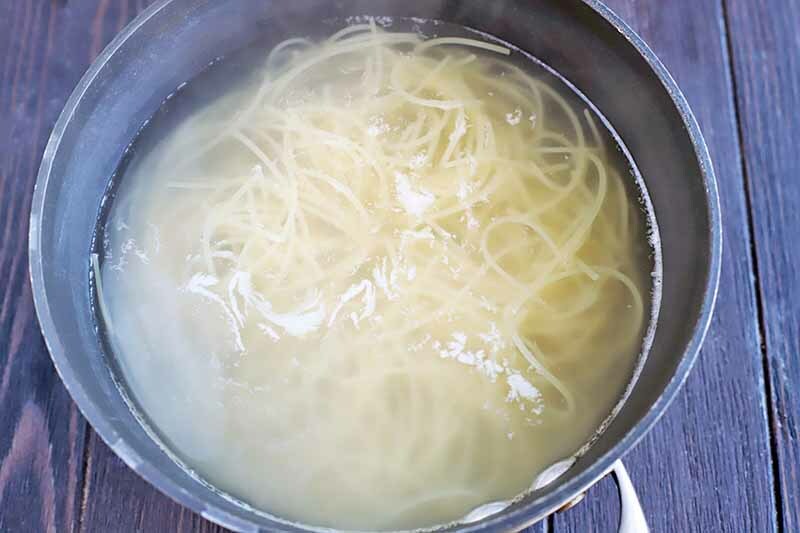 Reserve 1/4 cup of the cooking liquid, and drain the angel hair in a colander or fine mesh strainer. In a small saucepan, melt the butter over medium-high heat. Stir in the lemon zest, lemon juice, cream, and reserved pasta water. 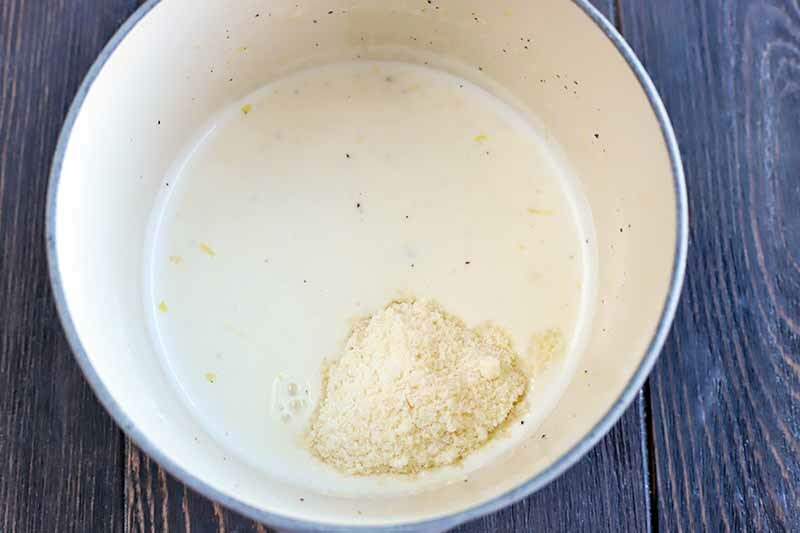 Remove sauce from heat and stir in the Parmesan cheese. Season to taste with salt and pepper, if desired. 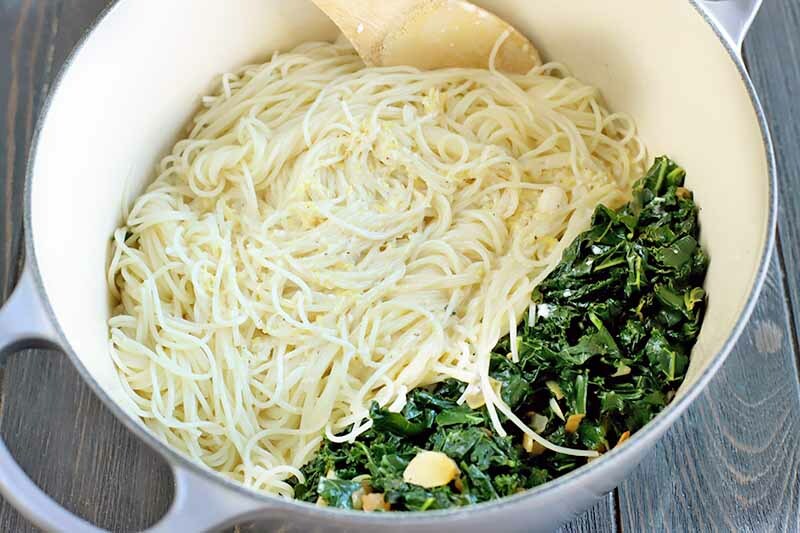 Add the cooked pasta and lemon sauce to the kale mixture, and toss with tongs to combine. 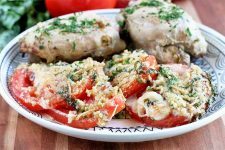 Serve immediately, with additional lemon zest and grated Parmesan cheese on top. 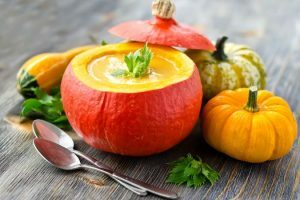 Can I Use Another Vegetable Instead? 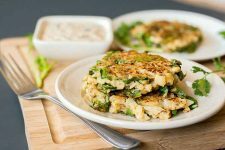 I know that not everyone is a kale fanatic, and I do believe this recipe is worth a shot if you’re on the path towards expanding your horizons. 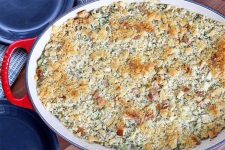 Simply use traditional Swiss chard or rainbow chard instead. 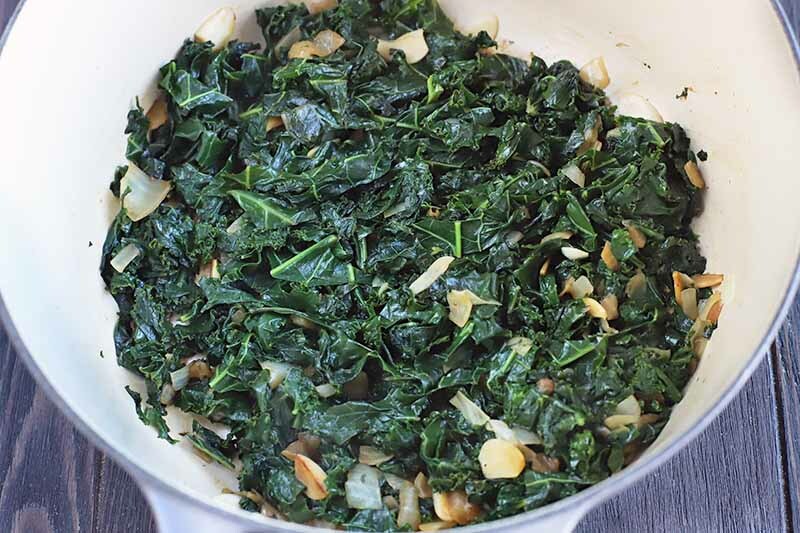 Prepare the chard and cook it the same way that the recipe describes cooking the kale. It’ll be just as tasty. 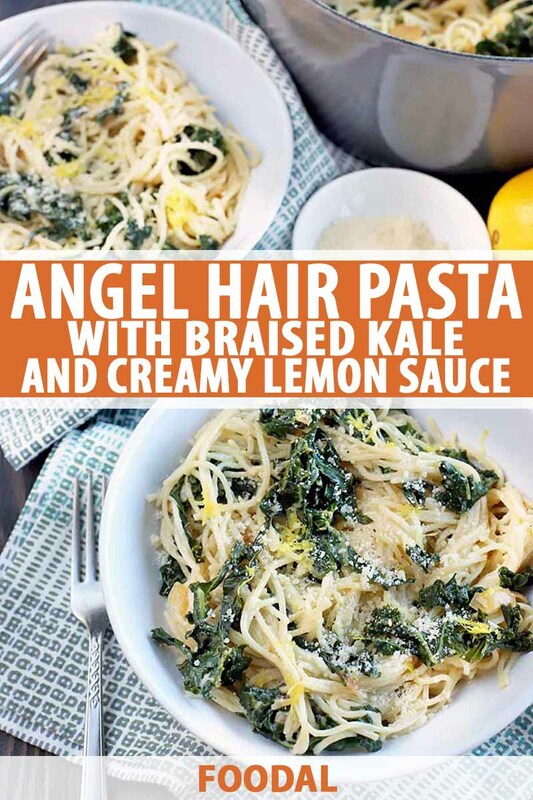 What’s your favorite angel hair recipe? Tell us in the comments below, and be sure to rate this recipe once you try it for yourself. Photos by Meghan Yager, © Ask the Experts, LLC. ALL RIGHTS RESERVED. See our TOS for more details. Originally published on October 22, 2009. Last updated: February 11, 2019 at 17:40 pm. With additional writing and editing by Meghan Yager and Allison Sidhu. I can’t say that I’m a fan of kale, as i didn’t grow up with it either, but I don’t have an aversion to it. I think it’s more like, I don’t have a craving for it. Given choices I would not choose kale. I’ve made kale the same way to just eat as a side. It really needs lots of lemon and parm but man its good once you get the right balance. I have similar issues with kale, though I did grow up eating it. 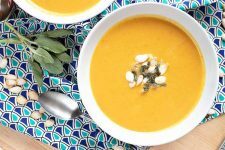 My favorite way to eat it is in soup: Portuguese Kale soup with chorizo that’s utterly delicious! Ah yes, I’m still compelled to spell out my cooking mistakes from time to time to readers who might think me above them (truthfully, I’m not terribly sure how they came to that conclusion to begin with). Kale was a foreigner in my house, same for Brussels sprouts and many other greens beyond spinach. 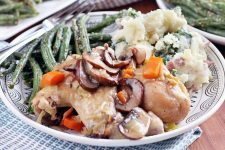 It looks healthy and delicious… I am going to try it with some Swiss chard I have in the fridge. I’m wondering if adding the garlic then continuing to cook until the onion is brown might make the garlic bitter. Did you find this to be a problem? THAT looks delicious, and I’m new to kale, too! 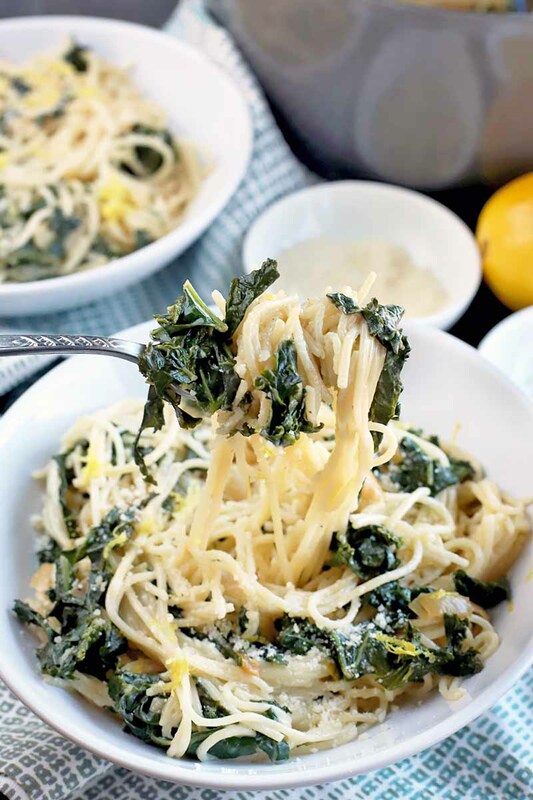 I love just about anything involving angel hair pasta, though, so I just might get me some kale! I’m glad you’re giving kale a chance. It’s one of my very favorite vegetables. 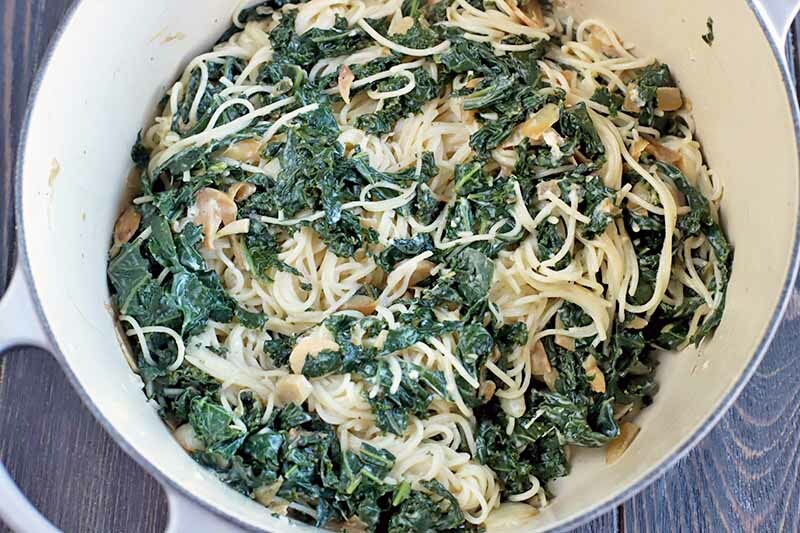 My very favorite way to eat it is to simply saute a whole diced onion in olive oil until it’s very sweet, then add the kale and let it wilt. 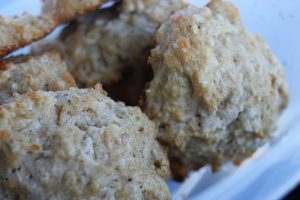 It turns out simple, sweet and delicious, and I find it really hard to stop eating. Like, really really hard. 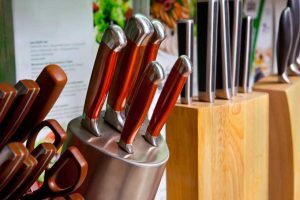 I definitely would share any mistakes I make in the kitchen, I hate making them! But I have to say, OMG, that first picture of the pasta looks AMAZING. What does kale taste like? I have never had kale, but I’ve had dandelion leaves and I am not a fan… I heard that most greens like that are the same and if that’s the case, no thank you! I try to not be so stubborn about foods. In culinary school, our one teacher always said, if you’ve never had it before, all I ask is that you try it. If you don’t like it, fine, but just try it. So I did. And there were things I loved, things I’d eat again and some things, like foie gras, that I will never put in my mouth, EVER AGAIN. Are there different types of Kale? I bought a curly variety last week that turned out ok, but yours looks better. oh how i love kale. something about eating leaves just makes me feel so fresh and closer to the earth or something. yes, if it’s green and leafy, i’ll eat it. 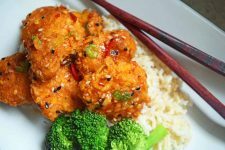 and this recipe looks so perfectly simple, i will most definitely try it. i am laughing! i do those things all the time, too. 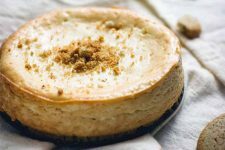 what a delicious recipe…thanks! I haven’t eaten much kale yet myself. It’s one of those things I know I should eat, which is why I put in on the menu for cooking Italian, a torte with kale. We’ll see. I love kale and this looks delicious!! 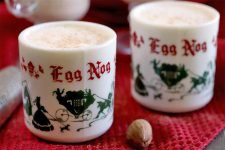 This is the first time I am visiting your blog and I have to say that I really enjoyed reading this post! Prejudice against vegetables abounds in my apartment thanks to my husband, who thinks Nutella is a food group. Since starting my food blog I have tried very hard to taste new things that I was scared to try, and to retaste old things I thought I hated. Some of my prejudices have changed. Some have not. It’s good to know that someone else is fighting the same battle. 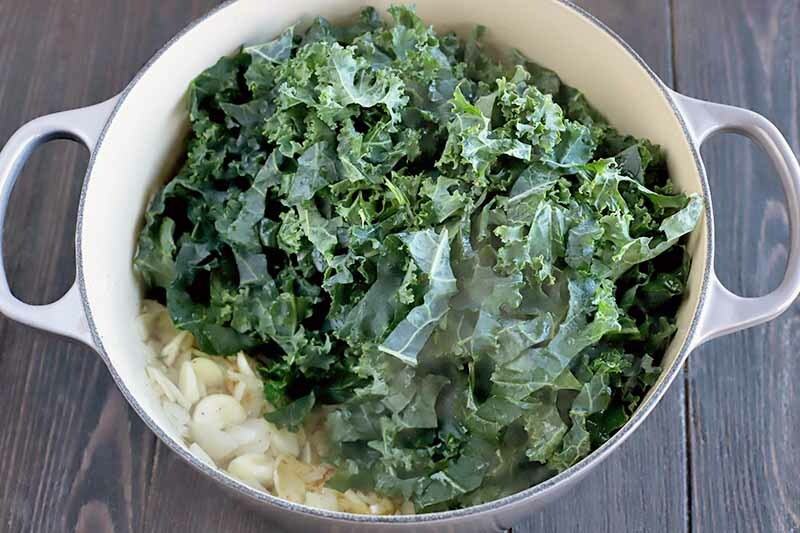 have you tried adding a little nutmeg, some raisins and a wee splash of cider vinegar to your braised kale? 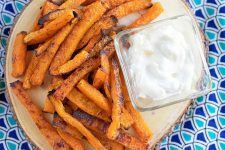 wouldn’t work for this recipe, but as a side dish, it’s really tasty.